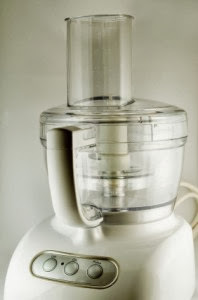 Today we're talking about decluttering small appliances. 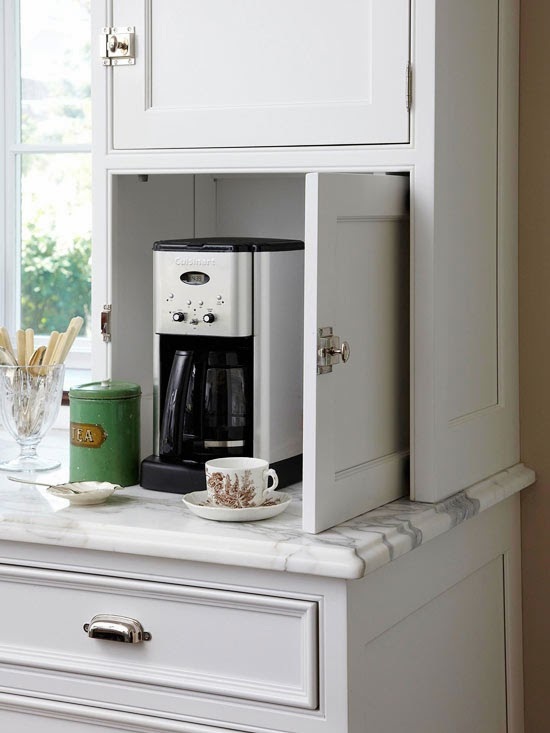 Do you have cupboards full of appliances you rarely use? Or maybe even never use? Maybe they are things you think you should use, but in real life you don't actually use them. These small appliances take up valuable space in our kitchens and contribute to the overwhelming feeling of a cluttered home. If you remove some of the appliances from your kitchen, you could spread out some other items and end up feeling less cluttered when you open your cabinets. You could even move things off your counters and into cabinets so there's less visual clutter when you walk into the kitchen. If less clutter sounds good to you, consider which of your small appliances you can declutter today! It's completely your choice what you keep and what you purge. These guidelines may sound harsh, but living a less cluttered life means choosing to live in the present rather than in the past. It means being realistic about who we are now and not who we think we want to be or feel we should be. If you don't enjoy baking bread, why keep a breadmaker? If you don't use your electric carving knife because you don't cook turkey or roast beef (or you just use a regular knife), why let it take up space in your cabinets? You may be saying, "but I paid a lot of money for that!" or "it was a wedding gift!". That may be true, but it doesn't change the fact that you're not using it. You won't get that money back by keeping it (you may even make a bit of money if you're able to sell it). So let it go. The person who gave you that appliance gave it to you as a gift. Not an anchor to weigh you down. Set it free. You'll be glad you did. So take 10-15 minutes today deciding what small appliances you can part with. And then enjoy the peace of less cluttered cabinets. Here are some more tips on decluttering small appliances and storing the ones you keep. You can reorganize the small appliances you've decided to keep to get more of them off your counters. 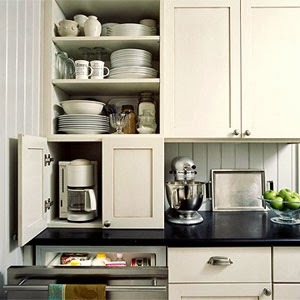 Or reorganize some of your kitchen cabinets now that you've created more room. 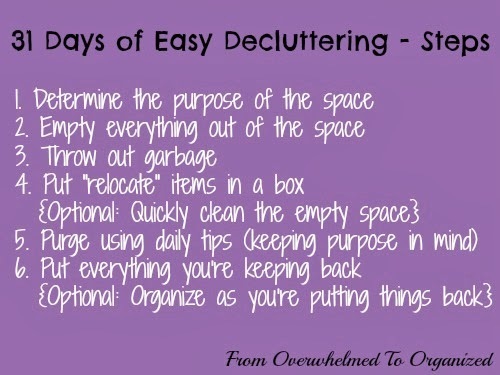 Or you can take on decluttering another area of your kitchen. Visit my Kitchen Organizing board for more ideas on organizing your kitchens to combat the clutter. Update: I haven't been seeing many photos shared lately so I'm wondering if there's enough interest to have a link party. Please comment on whether you have posts you'll link up or start sharing your pictures so I can decide. If there's not enough interest I will share some of the pictures I've seen so far on the last day instead. 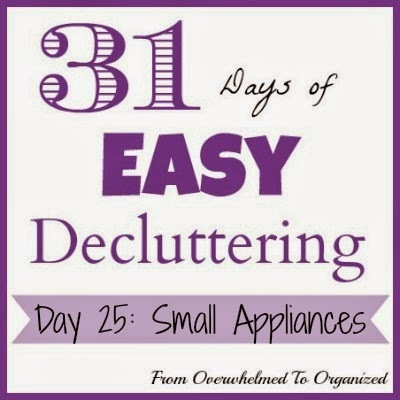 How many small appliances did you declutter today? How do you organize your kitchen to help keep it clutter free?